Mr. G's musings: Are Atheists Generally Smarter Than Religious People? I very much lean toward atheism. Although I have to say since Trump was elected I say a prayer every night for our future. I'm sure it's learned behavior from my upbringing. 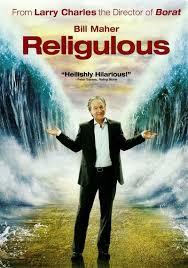 Bill Maher's brilliant documentary in 2008 titled Religious really made me come to a conclusion. But I still have a huge curiosity of the massiveness and the complexity of the universe. So maybe I'm an atheist. But I know for sure that I'm NOT smarter. The algebraic question in this article baffled me. I simply do not understand algebra or math word problems. This article is a very curious discussion. And a great movie! Goodness, that link had a lot of words! My eyes began to glaze over before I was finished with it. I don't think it's a matter of "intelligence", it's just an unwillingness to reject superstition as "fake news".